Windy, sunny, spring weather ahead today – Welcome to Wyandotte Daily! Today’s forecast is sunny, windy and a high of 72 degrees, according to the National Weather Service. 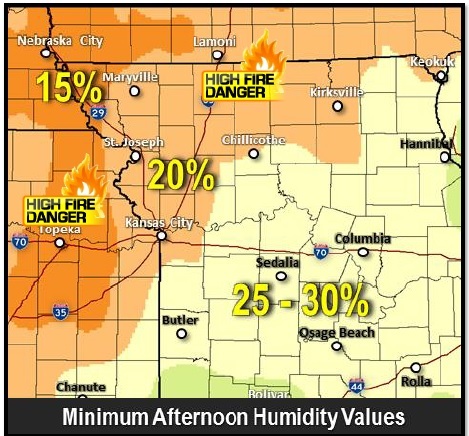 The windy weather has led the weather service to warn residents of a potential fire danger this afternoon because of dry conditions and winds. According to the weather service, the greatest fire risk will be north and west of I-35. A south southwest wind is expected to be 5 to 15 mph today, the weather service said, with gusts as high as 21 mph. Monday night’s low will be around 48, according to the weather service. Tuesday, expect sunny skies with a high near 77, the weather service said. The wind will be calm to start the day, changing to east northeast 5 to 8 mph in the morning, according to the weather service. Tuesday night’s low will be 53. Several rounds of thunderstorms are possible Wednesday night through Friday, the weather service said. The threat of severe weather is marginal at this point for Wednesday night’s activity, according to the weather service. Wednesday, expect a high of 81 degrees, with southeast winds from 9 to 14 mph increasing to 16 to 21 mph, possibly gusting to 29 mph, the weather service said. Wednesday night, there is an 80 percent chance of rain and thunderstorms, with a low of 54, according to the weather service. Thursday, the chance of rain and thunderstorms is 30 percent, with a high near 68, the weather service said. Thursday night, the 30 percent chance of rain and thunderstorms continues, with a low of 44, according to the weather service. Friday, there will be a 30 percent chance of rain with a high of 54, the weather service said. Friday night, expect a low of 36. Saturday’s high may be 63, with sunny skies, according to the weather service.